Urban Space keeps changing their vendors. It appears that some, like Roberta’s, Red Hook Lobster, and Delaney Chicken, aren’t going anywhere any time soon. But other stalls are temporary. After the expected turnover of No. 7 Veggie to Kuro-Obi, news now comes of two other changes. 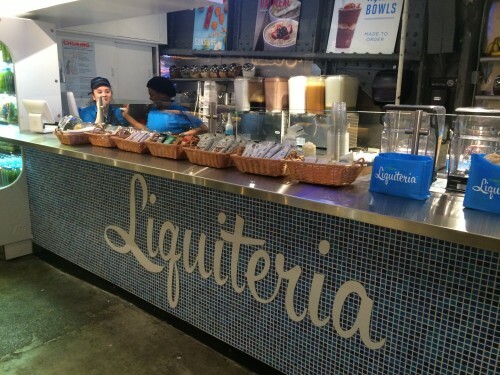 The Asia Dog kiosk has morphed into the most opposite food stall possible: Liquiteria. Instead of kimchi-topped hot dogs, you can now get juices and acai bowls. A slightly bigger win for gluttons is that the healthy Sips & Bites was replaced by the sushi burrito stylings of Hai Street Kitchen, according to Eater. We’ll also keep you up-to-date as other options come and go. Posted by brianhoffman at 11:30 am, March 17th, 2016 under Urban Space.